National Charter Bus should be your top choice for a safe, reliable, and comfortable group transportation in Cincinnati. Whatever brings you to or around Cincy, we’ll be sure your group has the best trip possible. We’ve serviced school field trips, personal group vacations, corporate conferences, and various other types of events in the region. Give us a call at 513-538-0404 to find the best charter bus or minibus for your next planned group event in Cincinnati. 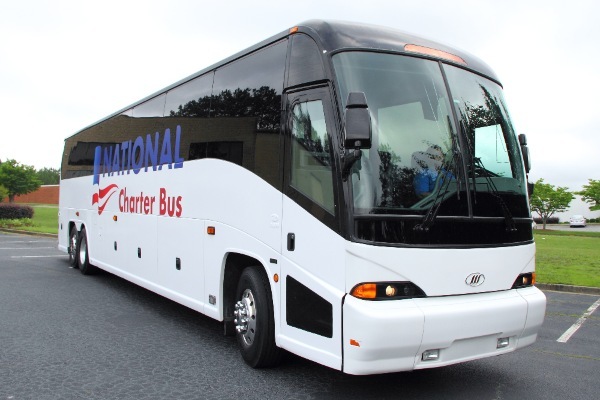 At National Charter Bus, we pride ourselves on offering top-notch services so our passengers can focus on enjoying every other aspect of their trip. From long-distance travel to Columbus and Indianapolis to in-town day trips, we’ll help simplify the travel process for your group. Choose from spacious full-sized coaches for large groups or select from several models of compact minibuses. 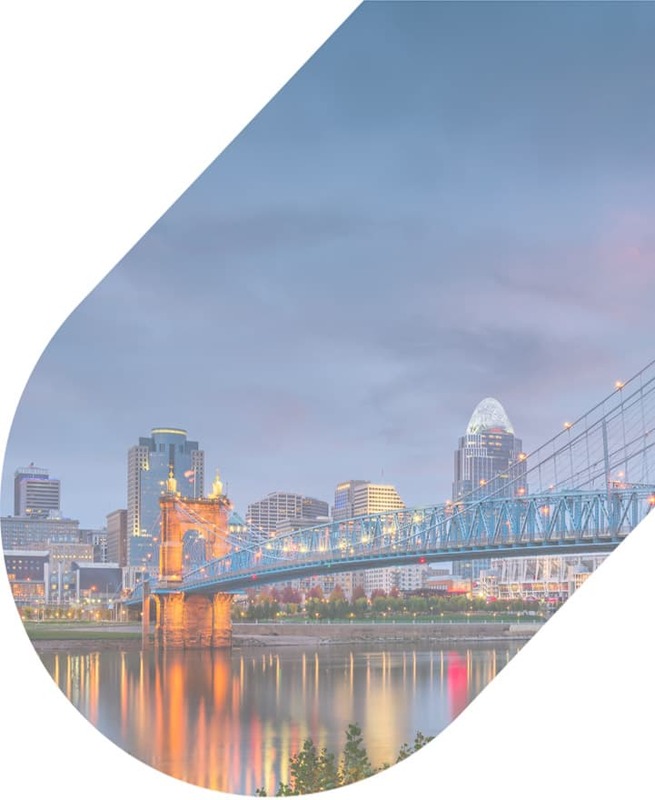 Each bus rented through National Charter Bus includes a professional driver to handle the Cincy roads while you travel in comfort with premium amenities like plush, reclining seats, on-board restrooms, complimentary WiFi, and televisions with DVD players. Are you planning a big corporate event in the heart of Cincinnati? Rely on National Charter Bus to streamline transportation for every guest attending your event. Large business conferences being held at the Sharonville Convention Center or Duke Energy Convention Center can provide shuttles from nearby hotels for important attendees and speakers to utilize for the event. Shuttles help cut down on the amount of traffic around busy downtown Cincinnati roads. Out-of-town convention attendees can leave the driving up to professionals while they relax before and after important business endeavors. Planning a wedding is already hectic for the bride, groom, and wedding planner. Let us worry about transportation for your guests! Don’t worry about guests getting lost or failing to find parking for your special day. If you’re planning to host your ceremony and reception in separate locations, wedding shuttles are also an efficient way to get everyone from the St. Aloysius Wedding Chapel to reception venues. Popular reception locations like the Renaissance Cincinnati Downtown and the Belle Event Centre are located in bustling neighborhoods around downtown, meaning that parking for large events may be tricky. Skip each guest needing to drive by providing a sleek and modern wedding shuttle for your event. Wedding shuttle buses will ensure every guest arrives at the venue in a timely fashion to enjoy your beautiful ceremony. George Gallery). At the end of the night, they’ll have a safe ride back to their hotel to rest from the night’s festivities. Schools, summer camps, and youth groups can rest assured that every child and chaperone will be in good hands with a charter bus rental from National Charter Bus. A private transportation rental will provide everyone with optimal comfort and safety throughout your field trip to the Cincinnati Zoo or outing to the Great American Ball Park. Each bus is outfitted with modern safety features, and each driver must clear extensive background checks before getting on the road. Students can stay entertained throughout the drive with on-board WiFi, televisions with DVD players, and more with a private rental from National Charter Bus. Ready to plan your next group trip in Cincinnati? Get the rental process started with National Charter Bus Cincinnati. We have rental experts on standby 24/7 at 513-538-0404 to help you choose the best charter bus for your upcoming trip. Our rental experts will provide you with a custom rental and get you a quick, no-hassle quote!